The human armour was held out-of-town, in reserve: two Dreadnoughts, two Land Speeders from the 3rd Air Support Wing, a Whirlwind, a Vindicator, Two Razorbacks, and a Rhino containing the 2nd Tactical Squad/6th Company (“Gryphonne’s Fist”). The Greenskin assault force consisted of the 1st and 2nd ParaBoyz Mobz (25 strong each, with Rokkits and a PK Nob), a mob of (16) Polish Paragrots, two Deff Koptas, and a small (4) squad of MegaNobz personally lead by Warboss Frozt. These would deepstrike into battle, and then seek to take the north end of the bridge, using their MeltaCharges to destroy buildings and bunkers. Not many would likely survive, but they would create Orky havoc, blocking reserves and buying time for the relief force to arrive from the south. Far above the battlefield aboard the orbiting Ork Rok Arrayyeff, Field Marshal Waaaghgomery weighed his options. Would he go for a night assault, in the hopes that it might shield his troops from enemy fire and allow them precious breathing space to seize their initial objectives? Or would human searchlights and other night vision aids offset such a stratagem? Would it be better to use the Arrayyeff’s dominance of the skies to just blow lots of things up? The latter, of course, had a far Orkier feel to it–and had the added advantage that it might destroy buildings and bunkers, and kill or disorient those sheltering inside. After much deliberation, this was the stratagem chosen. The first warning the Gryphonnes had of the impending assault was a dull roar in the sky, which grew to a cacophonious crescendo of shrieks, roars, and earth-shattering explosions. 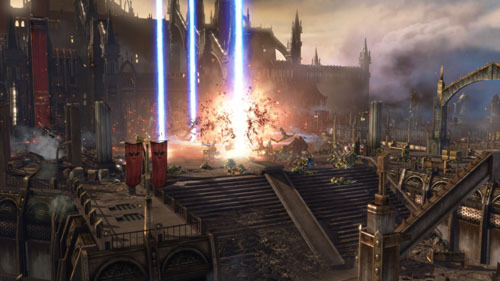 High above the planet, Ork Kill Kroozers rained destruction upon Orkhem as seven detonations shook the city (Firestorm). No sooner had they finished, when bits of old spacecraft were hurled down from high orbit by the Arrayyeff’s powerful Mek-built traktorbeamz (Crash and Burn stratagem). 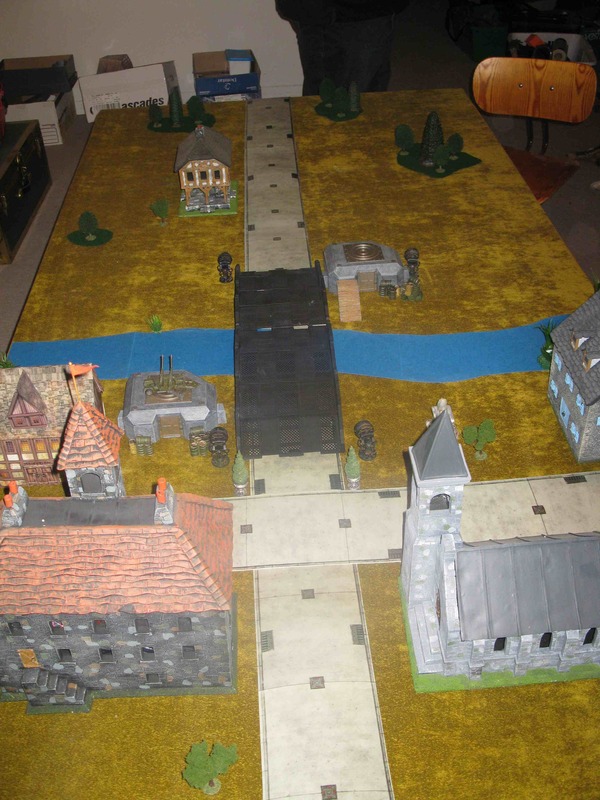 Within minutes, the Town Hall had been reduced to ruins, although the Tactical Squad inside had lost only two Marines. 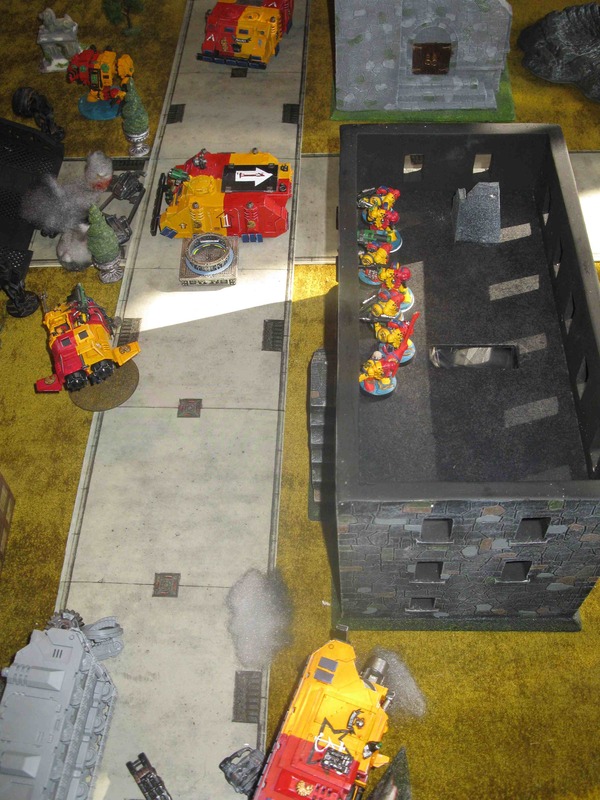 The northern bunker had been hit twice and the Terminators stunned, but it had not been breached. One large mass of flaming debris had landed on the bridge itself, weakening it and creating a tangled heap of metal which would impede any movement. All told, however, it was much less damage than the Orks had hoped for. To their credit, the Gryphonnes reacted quickly, pouring reinforcements onto the battlefield, On the southeast bank of the river, a Speeder and a Dreadnought arrived. A second Speeder and a Razorback entered the town carefully via the east road. 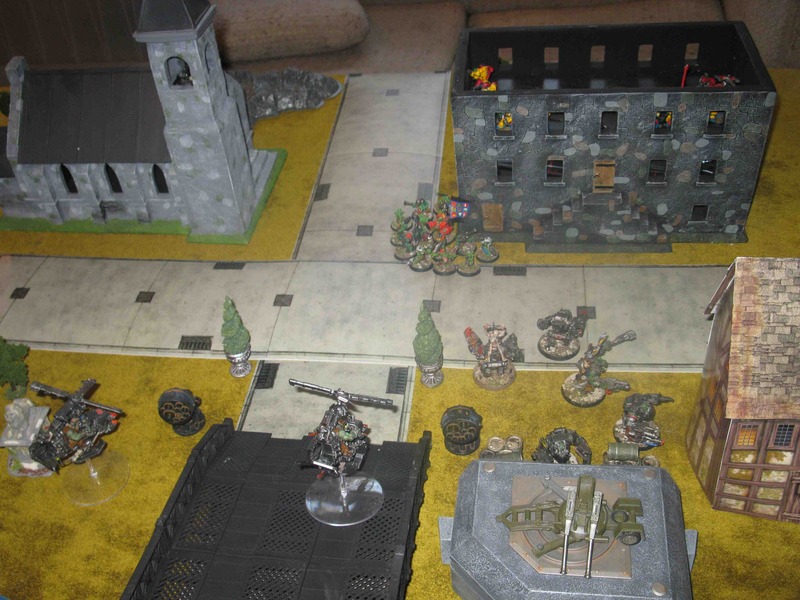 To the north, a Rhino (and Tactical Squad) edged forward, while the Whirlwind took up a position behind the ruined Town Hall. To the west, the other Razorback and the second Dreadnought entered the city. Finally, the wily von Tattau revealed one of his cunning defensive preparations as the Terminators exited the bunker from a hidden sewer grate in the road and prepared to assault the MegaNobz. Fearing their anti-armour capabilities, the Deff Koptas were a priority for the human forces. Within minutes, both of those in the city had been destroyed. the Grots also took heavy fire from the two Space Marine Squads in the buildings, and the few survivors were wiped out in close assault by the Gryphonne’s Talon. The Terminators, however, were perhaps overconfident in their ability. 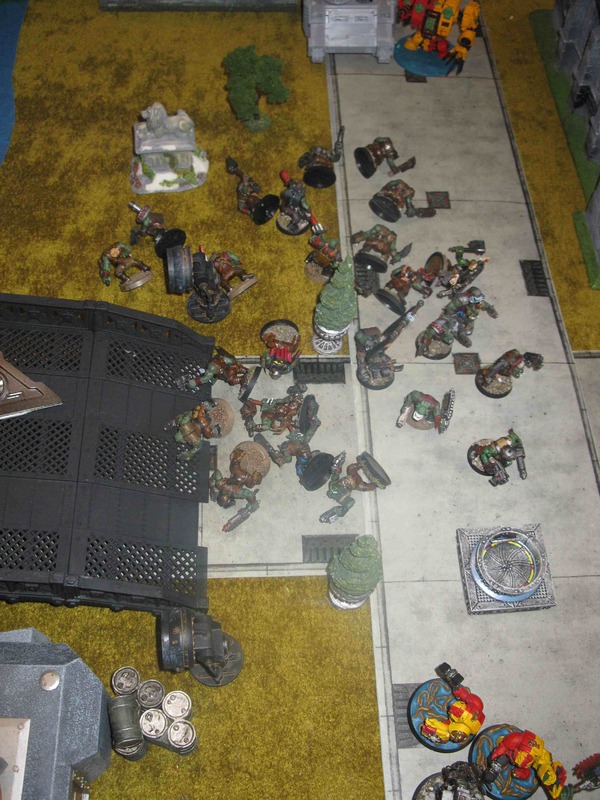 They charged in, only to find one of their number felled almost immediately by a blow from Warboss Frozt’s Big Choppa (or, perhaps, a bite from his trained Attack Squig, Kuddles). Two MegaNobz were felled, but not before a second Terminator had also fallen. The melee would continue. 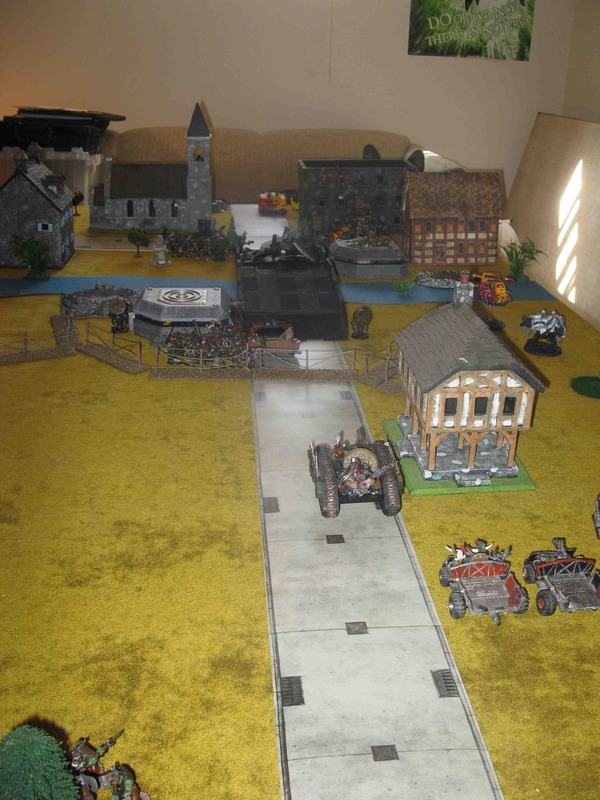 To the south, the Devastator Squad let loose its array of heavy weapons at the Trukk of Irushgardz, but either missed or found themselves thwarted by the effect of the KFF in the Wagon behind it. Bellowing with rage—not because he was especially angry, but rather because he liked to bellow with rage—Warboss Frozt and the remaining MegaNob charged the Vindicator and Razorback on the east approach road. Both were quickly pulled apart into tangled heaps of metal. 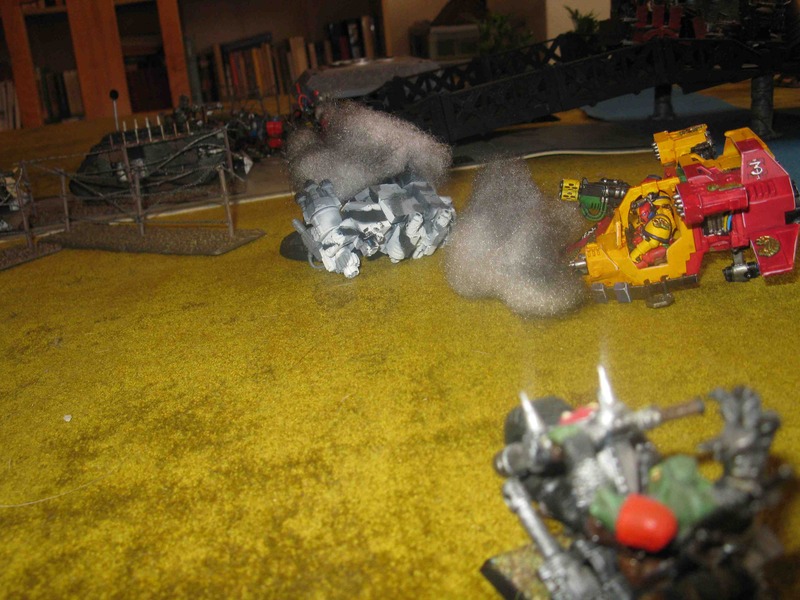 (Picture left: disassembling Marine armour, Ork-style) The few surviving 2nd ParaBoyz fired at then charged the Church, and succeeded in bring it collapsing down with the MeltaCharge. The Marines inside were unharmed, however. South of the Rhinox, the Irushgardz ‘Ardboyz had enough of the bunker, and loaded up into their truck and moved to the centre of the bridge. 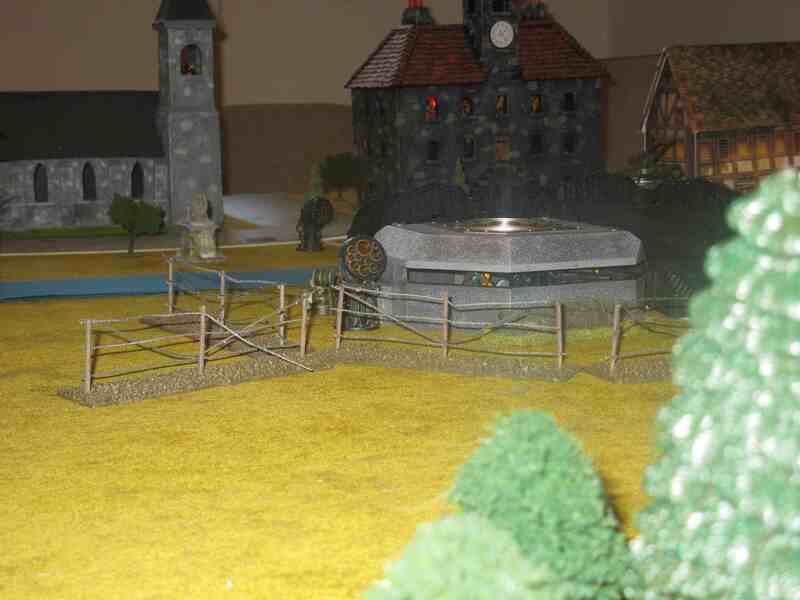 Their place was taken by the Burna Boyz, who disembarked from their Wagon after it moved forward, and then flamed the fortification. (Picture left: let it burn!) Three of the Devastators were killed. 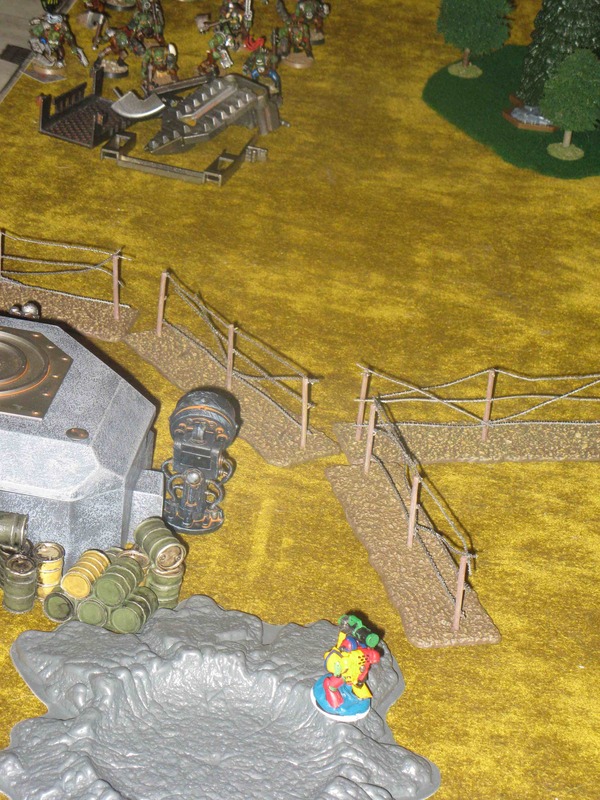 They and the Big Mek then assaulted the bunker, failing to destroy it with their MeltaCharge. The one remaining Devastator fled the bunker, running to the northwest. Inside the Boomgun Wagon, someone pushed the wrong button. The tank charged ahead at full speed, unable to take a shot. Meanwhile, the 1st Paraboyz extricated themselves from the woods, and started the long march towards the sound of the guns in the city. On the southern road, a small unit of Grot infantry appeared, and did much the same (scenario special replacement rule). Wazzdakka Gutsmek maneuvered behind the southern Dreadnought, and destroyed it with a blast from his Dakkakannon. (Picture right: Honoured Brother Brinkman goes down) Sadly, the biker-turned-warboss would soon be killed by a Typhoon Missile from the surviving Land Speeder north of the river. As if of something of a theme, Warboss Frozt was killed moments later by shooting from the Tactical Squad in the ruined Town Hall. The Space Marine Predator moved forward to the southern edge of the bridge, and started pouring fire into the ‘Ardboyz, killing two. The Dreadnought in the city, commanded by the famed Brother Hummel, assaulted the remnants of the 2nd Paraboyz and killed all but the Nob. 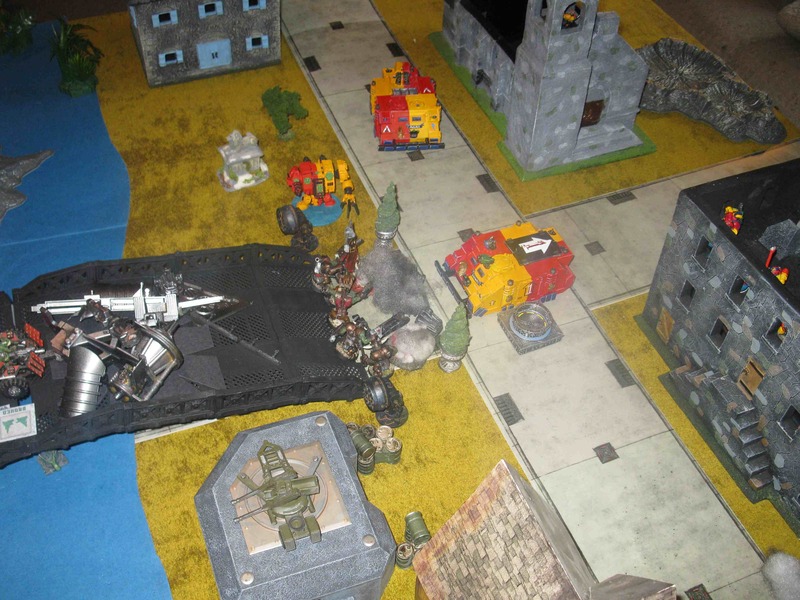 Fire from Space Marine units immobilized the Irushgardz Trukk atop the bridge, and destroyed the Velshgardz Trukk to the south, killing several. 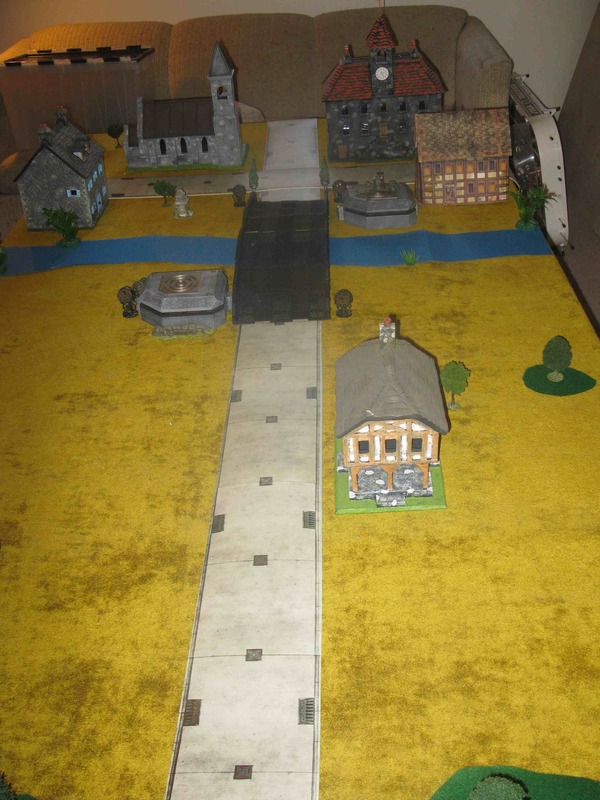 The Orks were now firmly in the control of the southern edge of the bridge, while the Marines were converging on the northern side. Could either army seize both sides and secure a victory? The remaining MegaNob looked down at the bullet-ridden body of Warboss Frozt, and bellowed with rage—not because he had particularly liked the now-dead warboss, but just because “bellowing with rage” seemed all-the-rage at the moment. He turned to the nearby ruins of the Town Hall, and charged in—only to find him face-to-face with the legendary Lindvig von Tattau, who had detached himself from the Tactical Squad to take up a position where he could better use his Conversion Beacon. Tattau lunged at the hulking Ork, and missed. The Nob swing back more ponderously, but more powerfully—removing the human’s pinky, squishy head in one fearsome, mechanized blow. The 2nd ParaBoyz Nob outside the Church was less successful. His head was removed by the Dreadnought, finally eliminating the greenskin unit. Atop the bridge, the Irushgardz glared at the deadly Predator that had just killed several of the companions, and did what any ‘Ardboyz would do: they charged it. As the Boyz laid into it with their Choppas, the Nob used his PowerKlaw to rip open its fuel tank, causing a satisfying explosion. (Picture right: disassembling Marine armour, Lesson Two) The bridge was—for this brief moment, at least—fully under Ork control. At the southern edge of the bridge, the Rokkit-equipped Mek attached to the Burna squad took aim at Private Eddy Abby-Alta, and killed him. 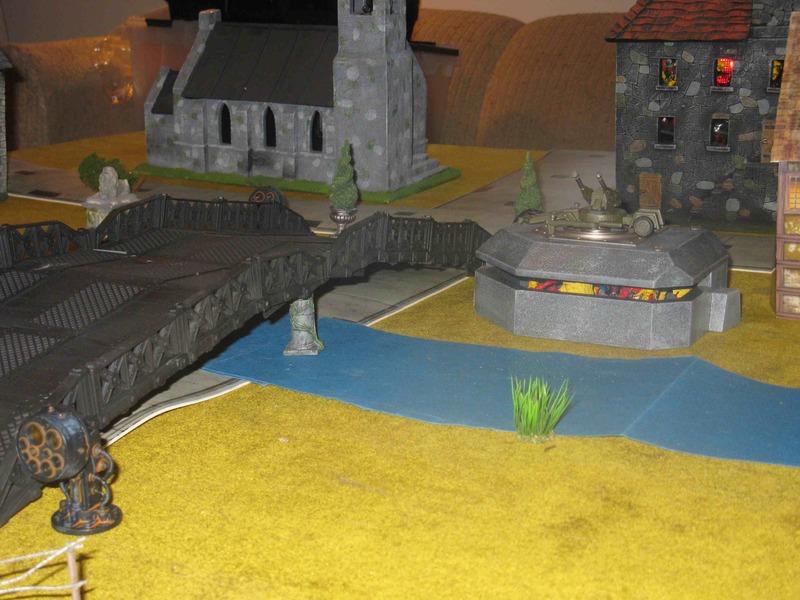 The squad’s Looted Wagon moved up the bridge where it both blocked the enemy and was shielded by the KFF. It scored several hits from its Big Shootas on the surviving Land Speeder, but failed to damage it. The Velshgardz moved to take up positions in cover at the southern end of the bridge. 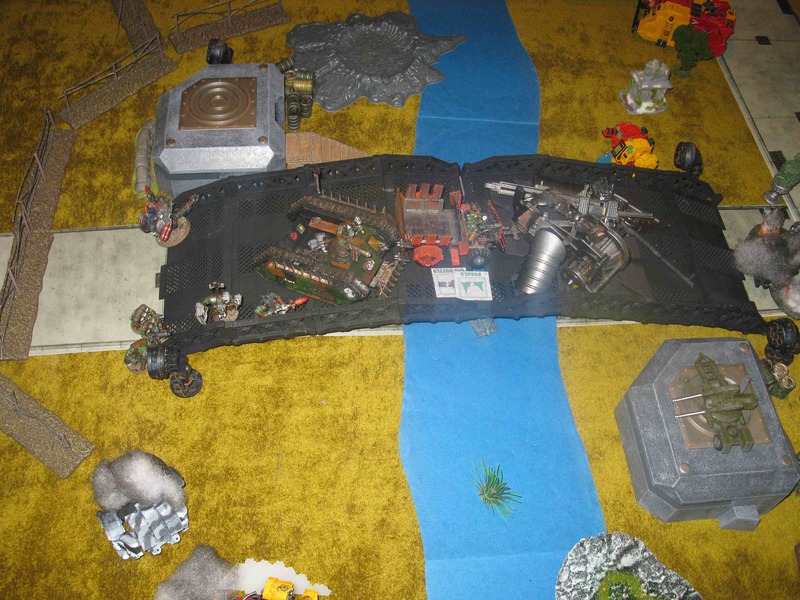 The Koldstriimgardz moved to the southern bank of the river, in the hopes of jumping across it the next turn (scenario special daredevil Trukk rule)—and fervently hoping that they wouldn’t plunge into the river and become “cold stream” guards in the process. The Space Marines at this point they still had considerable forces intact: a full Tactical Squad and most of a second, together with a Rhino and a Razorback; a Scout Squad led by Sgt. Telion; Venerable Brother Hummel in his Dreadnought “Iron Fist;” a Whirlwind, and Land Speeder 503 of the 3rd Air Support Wing—all on the north side of the Rhinox River. 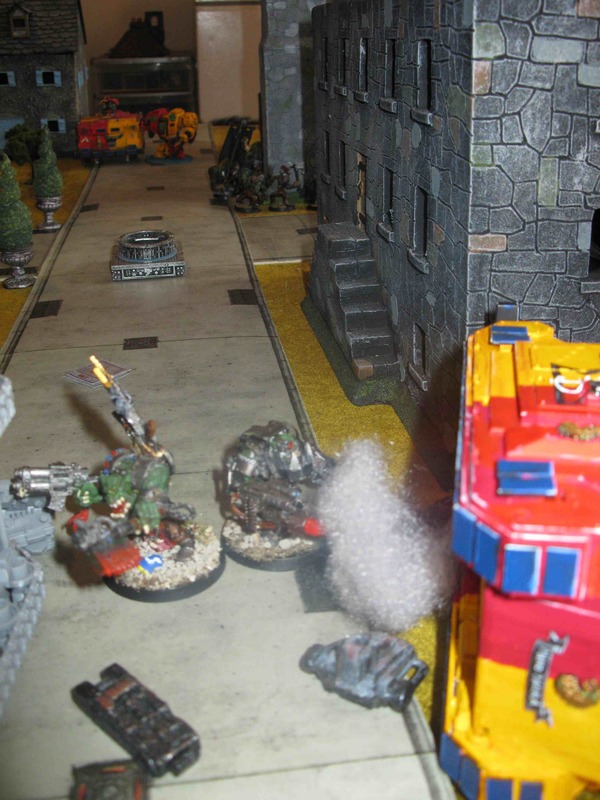 The Orks, on the other hand, had a weaker force: one full-strength mob of Koldstriimgardz Boyz in their Trukk, plus half the Velshgardz on foot; the Big Mek and his open-top Looted Wagon; the near full-strength unit of 1st ParaBoyz, now finally approaching the bridge after a long slog on foot after their deepstrike mishap; and a full unit of reinforcement Grots (such as they are) marching up the road. The bridge over the Rhinox was truly blocked: two wrecks/craters, an immobilized Trukk, and the Wagon all stood upon it, slowing any possible assault to a crawl. 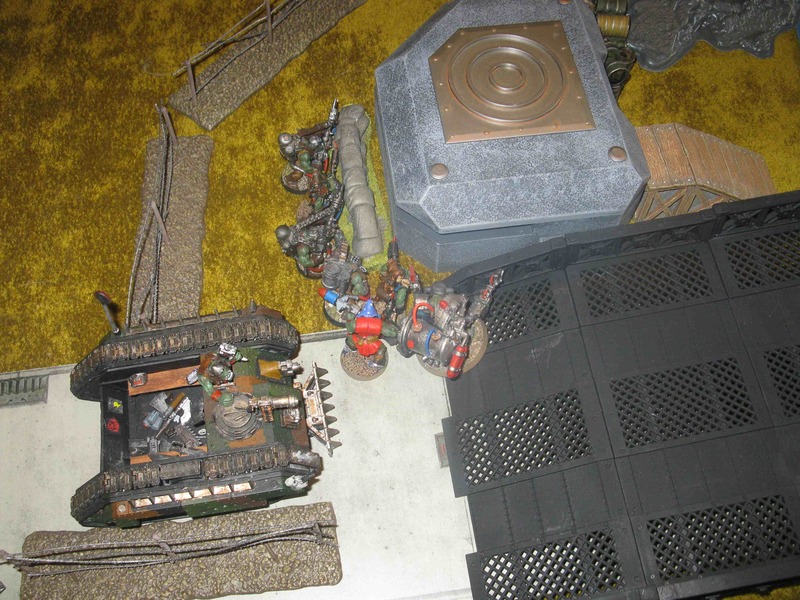 (Picture below: blockage on the bridge) The Orks had no long-range or heavy weapons beyond a few Rokkits and Big Shootas, while the Marines could call upon the Whirlwind and missile-equipped Land Speeder (plus a Lascannon, Missile, and a Stalker Pattern Bolter among the infantry) to rain down fire from a safe stand-off distance. 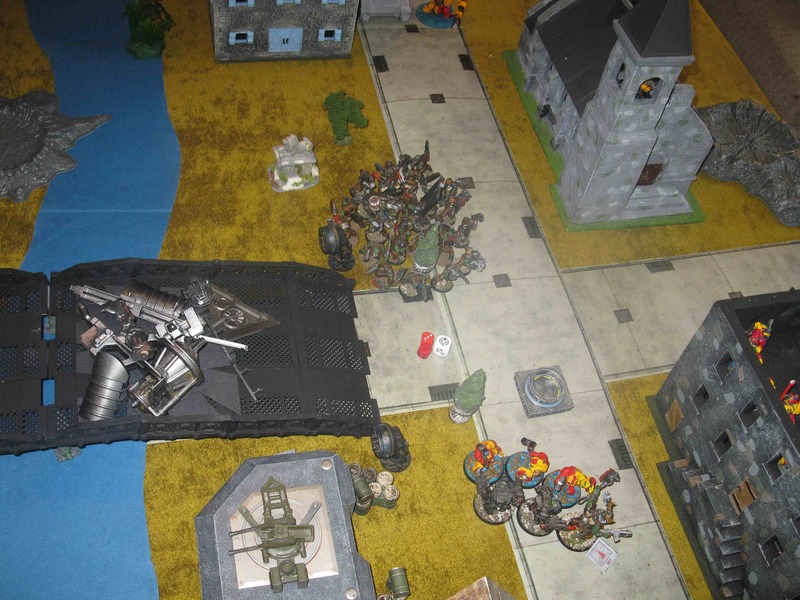 Both the surviving Marine armour and the Ork Trukk could attempt river crossings by either swimming or jumping (scenario rules), although not without significant risk of drowning. 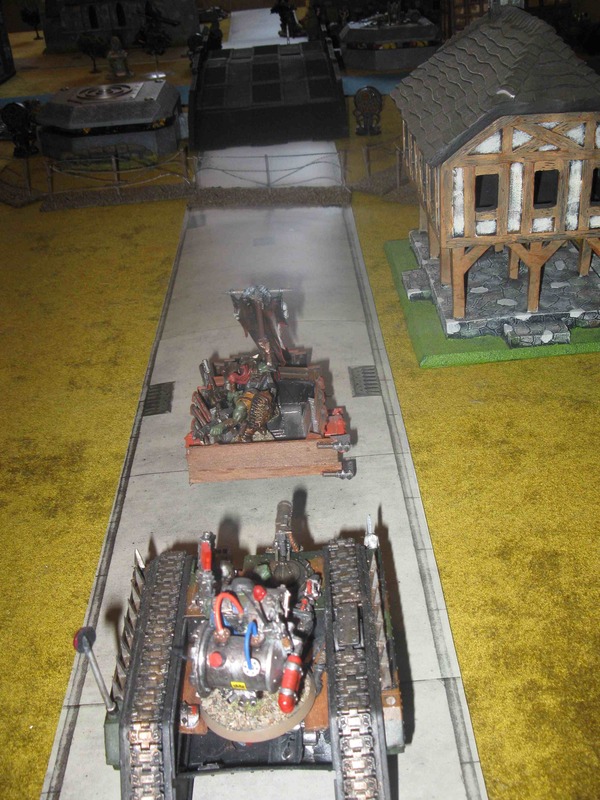 The Orks, however, also had 3-4 PowerKlaws on, or within assault range, of the bridge. With the structure having already taken one point of damage, this meant they could quickly make it completely impassable to the vehicles and Dreadnought, or even destroy it altogether and deny either side victory. With a freak electrical storm descending over the area (meaning we were running out of game time), the battle was called as an exciting, bloody, and well-earned draw.